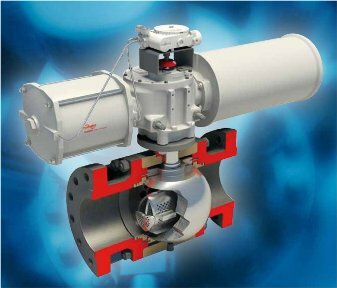 Valbart designed the Trunnion-Mounted Control Ball Valve, TMCBV, to operate at high pressures while minimizing the torque needed to operate the valve. The spring-loaded, process energized seats offer tight (Class IV and Class V) shutoff at any pressure. In most cases, the TMCBV’s capacity is greater than that of a comparable globe valve, which allows the customer to use a smaller TMCBV. The customer receives cascading savings by using a smaller, lighter valve. This valve also requires a smaller, less expensive actuator and less expensive pipe supports. Wide range of trim designs based on industry proven technologies such as MegaStream (up to 30dBA reduction) and Z-Trim (up to 23dBA reduction) for noise control and CavControl and ChannelStream for cavitation control. Metal-to-metal, tungsten carbide coated seats: Optional trim ideally suited for non-clean media. Compact design yields high flow capacity providing savings on valve size, actuator size, system support and isolation. Very high range ability in excess of 300:1. Tight tolerances maintained on stem-to-ball and stem-to-actuator connections for precise control and long life. No-bleed digital positioner with advanced diagnostics which can be integrated into a plant control system. Options for body, trim, bonnet, CRA overlay and seal materials available on VT1, VB3 and VW1 ball valves.